Effective January 1, 2014, California has enacted its first statewide well stimulation law, governing hydraulic fracturing and other well treatments (in the state’s Public Resources Code (Division 3, Chapter 1, Article 3, sections 3150 – 3161, enacted by SB 4 (Pavley)). Most responsibilities are assigned to the states Division of Oil, Gas and Geothermal Resources (DOGGR), although the State Water Resources Control Board (SWRCB) is assigned water quality protection responsibilities to develop model groundwater monitoring criteria that include consideration of impacts from well stimulation. What Does SB 4 Provide? 3152. 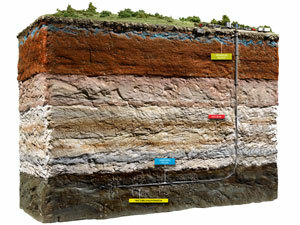 “Hydraulic fracturing” means a well stimulation treatment that, in whole or in part, includes the pressurized injection of hydraulic fracturing fluid or fluids into an underground geologic formation in order to fracture or with the intent to fracture the formation, thereby causing or enhancing, for the purposes of this division, the production of oil or gas from a well. 3157. (a) For purposes of this article, “well stimulation treatment” means any treatment of a well designed to enhance oil and gas production or recovery by increasing the permeability of the formation. Well stimulation treatments include, but are not limited to, hydraulic fracturing treatments and acid well stimulation treatments. “Evaluate the hazards and risks and potential hazards and risks that well stimulation treatments pose to natural resources and public, occupational, and environmental health and safety”, addressing potential water discharges and air emissions (including greenhouse gas emissions), and impacts on wildlife, native plants and habitat. Construction of wells and well casings to ensure integrity of wells, well casings, and the geologic and hydrologic isolation of the oil and gas formation during and following well stimulation treatments. Full disclosure of the composition and disposition of well stimulation fluids, including, but not limited to, hydraulic fracturing fluids, acid well stimulation fluids, and flowback fluids. Permits for well stimulation treatments. - Enter formal agreements with the California Department of Toxic Substances Control (which regulates hazardous wastes, and most site cleanups), Air Resources Board, SWRCB, Department of Resources Recycling and Recovery, and local water and air districts where well stimulation treatments “may occur”, delineating the participating agencies’ respective responsibilities. - While these tasks are under way (i.e., during 2014), DOGGR is to allow well stimulation treatment activities to occur, if the operator complies with specified notification requirements, and agrees to provide detailed information by March 1, 2015 consistent with the requirements to be included in the regulations. DOGGR has announced it is well prepared to meet these deadlines. It already administers detailed well construction and operation standards, and had released pre-rulemaking discussion draft of regulations on hydraulic fracturing in December 2012. SB 4 provides for notifications and permits beginning no later than January 1, 2015. It also requires DOGGR to establish a website by January 1, 2016, for posting of information about each well stimulation treatment project, including all required well stimulation fluid composition and disposition information, well identification number and location, and collected water quality data (prior to that date DOGGR can direct operators to post information on the voluntary industry website FracFocus (see below)). Does my organization conduct drilling and production activities involving petroleum and/or natural gas in California? If so, does my organization inject water and/or other materials to stimulate production? If so, does my organization presently comply with applicable regulations, including well construction and operation standards administered by DOGGR? If so, does my organization presently provide information about fracking projects to FracFocus? If my organization intends to conduct drilling and production activities involving petroleum and/or natural gas in California after January 1, 2015, is it preparing to comply with Well Stimulation requirements adopted by SB 4, as applicable? Jon Elliott is President of Touchstone Environmental and has been a major contributor to STP’s product range for over 25 years. He was involved in developing 16 existing products, including Securities Law: A Guide to the 1933 and 1934 Acts and their Amendments, including Sarbanes-Oxley and Dodd-Frank and The Complete Guide to Environmental Law.